Oral thrush is a common mouth infection. Though it may look extremely unpleasant, it’s really easy to treat, once it’s diagnosed correctly. One of the most common treatments is nystatin, and we’re going to go through the basics of this type of treatment. But first, a bit about the symptoms of oral thrush. While most of the times these ugly patches are the only symptoms, occasionally more severe signs might appear, depending on how bad the infection is. A blistering sensation in the mouth, loss of taste, difficulty swallowing (if the infection is localized in the throat) and hoarseness (if the trachea and the larynx are infected) are all possible signs of oral thrush. Left untreated, the candida in the mouth may move to other regions of the body, leading to even worse conditions such as infections of the lungs or the intestines. However, such cases are rare and usually happen to those whose immune systems are weakened and who neglect the initial symptoms. You can treat oral thrush with nystatin oral suspension. This treatment works by killing the candida colonies in your mouth. Before using nystatin drops, you need to make sure that you have discussed with your doctor any other medications you’re already using, as there’s a possibility of negative drug interaction. You should also let your doctor know if you’re pregnant – nystatin is an FDA pregnancy category C drug, meaning that the effects on the baby are unknown. You should take nystatin the way your doctor tells you to. Unless otherwise instructed, read the inside leaflet carefully, making sure you follow the correct dosage. The typical dose is 1 ml of suspension 4 times a day. You should use a dropper to spread the solution evenly over the infected regions of your mouth. Swish your mouth thoroughly and keep the solution in your mouth for as long as possible before spitting it out or swallowing, depending on your doctor’s advice. As with all drugs, nystatin oral solution may also cause some side effects, though relatively few people experience them. The most common are mouth irritation and sensitivity, slight sickness, and diarrhea. If you experience any of these, stop using the solution and contact your doctor. 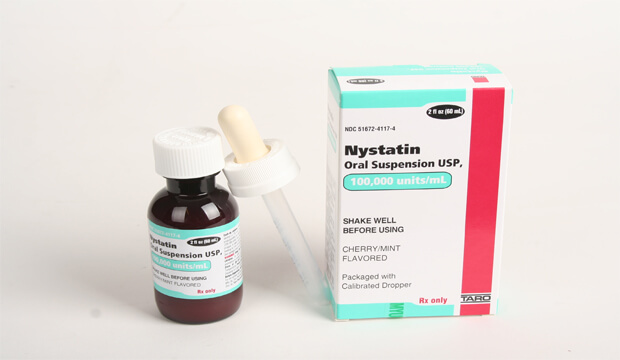 Nystatin oral suspension is a potent way of killing candida albicans, thus causing the thrush symptoms to disappear. Remember to use the solution as instructed by your doctor, and seek medical advice if you experience any unpleasant side effects, or if your symptoms to not disappear after a week.